Last week, Member of Parliament for the Northern Ontario riding of Thunder Bay-Superior North, Bruce Hyer, announced that he was leaving the New Democratic Party’s caucus over what appear to be irreconcilable differences between himself and the direction which NDP Leader Tom Mulcair wants to take on the long gun registry. Hyer also cited intransigence with party’s positions on climate change action, and significant concerns about the democratic deficit within parliament (especially those related to “whipped” votes). Hyer, along with NDP MP John Rafferty (Thunder Bay-Rainy River) was previously sanctioned by the NDP’s former interim Leader, Nycole Turmel, for voting with the Conservatives to repeal legislation related to the long gun registry. Turmel had indicated to the NDP caucus that they would be participating in a whipped vote in an attempt to preserve the registry. Previously, some NDP MP’s had voted with the Conservatives to send the bill to dismantle the registry to committee, ostensibly so that the bill could be amended to change the registry, rather than kill it outright. Ultimately, the Conservatives did not allow any amendments, and opposition MP’s were left with the choice of voting to save the registry as-is, or ending it. The Liberal Party and NDP whipped their caucuses to support saving the registry, which led to (in my opinion, unwarranted) accusations that some NDP MP’s such as Sudbury’s Glenn Thibeault had “flip flopped” on their positions regarding the registry. However, with a Conservative majority government, the writing had been on the wall all along to kill the registry. Hyer and Rafferty’s votes, frankly, did not matter one way or the other in terms of saving or dismantling the long gun registry. But what Hyer and Rafferty did was to place what they perceived to be the interests of their constituents over the interests of their Party, and in this era of ultra-partisanship on Parliament Hill, that’s one of the biggest no-no’s that an MP can commit. By putting the interests of their voters ahead of the interests of the New Democratic Party, Hyer and Rafferty received the punishment of being turned into non-entities in the House by Turmel, who removed their ability to ask questions in the House, which is really one of the most important roles that an MP can perform on behalf of their constituents. When Tom Mulcair became the Leader of the Party, Hyer and Rafferty’s punishment was lifted. However, in resigning from the NDP caucus, Hyer cited Mulcair’s desire to re-instate the long gun registry when the NDP forms government, through a whipped vote, as one of the major reasons for his departure. It seems that Hyer, who appears to want to hang around as an elected MP past 2015, did not want to find himself back in the same place he just emerged from – punished for voting on behalf of his constituents instead of following the Party whip. So now, Hyer has been banished to the nether-regions of the backbenches, where he’ll sit with other House “Independents”, such as those MP’s elected under the banners of the Bloc Quebecois and the Green Party. Hyer is likely already on a first-name basis with these MP’s, many of whom participate in the all-parties climate caucus, initiated by Elizabeth May, MP for Saanich-Gulf Islands. Hyer came to politics with a background in ecology, forestry and tourism. A successful local business person, Hyer was a community leader on issues related to the natural environment before deciding to pursue politics. He ran for the NDP in two elections, paying his political dues before finally being elected as MP in 2008. Aside from his recent renown related to the long gun registry, Hyer is probably best known for introducing Bill C-311, the Climate Change Accountability Act, a private member’s bill which was passed by the House under the Conservative’s minority government (it received support from the Liberals and Bloc Quebecois, along with the NDP). Despite its democratic passage in the House of Commons, the bill was ultimately killed by Canada’s unelected senate, on the direction of Prime Minister Stephen Harper. I’ve been watching Hyer’s career for some time now, given that he represents a Northern Ontario riding, and has a keen interest in taking action on climate change. While I did not personally support Hyer’s vote to dismantle the long gun registry, I have supported his decision to put what he perceived to be the interests of his constituents ahead of the interests of his Party. I certainly share Hyer’s frustrations with partisanship and the diminished roles which our elected officials appear to be playing in decision-making. Hyer seems to be concerned with the direction that Tom Mulcair wants to take the NDP. When Mulcair became the NDP’s Leader, Liberal interim Leader Bob Rae suggested that Mulcair was a “mini-Harper” due to Mulcair’s desire to micro-manage the NDP’s messaging and policy, which will no doubt further add to the democratic deficit in parliament. The NDP has always had a bit of an independent streak, but over the past decade, through the heavy-handed use of the Party whip, and with the Conservative Party as its role model, what we’ve seen is the evolution of the NDP towards a more carefully stage-managed party which values the consistency of its message over exercising its principles. This will likely prove to be a recipe for electoral success for Tom Mulcair, but it’s sure to rub many within the NDP the wrong way. Hyer rightly points out that, as an Independent, he’ll be able to vote his conscience on an issues-by-issues basis. However, as an Independent, Hyer is going to face some unique challenges with Canada’s democratic system, which is sorely in need of reform. By leaving the NDP caucus, Hyer has likely left behind a healthy Electoral District Association, which amongst other roles, acts as a fundraiser for candidates between elections. Only registered political parties are entitled to have these associations (known as “EDA’s” or “riding associations”); independents can’t set them up, and therefore can’t engage in fundraising between elections. Should Hyer wish to run again in the next federal election (and given his concerns about a future Mulcair government, it seems that Hyer is interested in doing so), fundraising is going to be an issue, although I suspect that with Hyer’s local popularity, there’s a good chance that many NDP members in Thunder Bay-Superior North will likely rally around him now, rather than the NDP, especially given Mulcair’s stated position that he wants to bring the long gun registry back. If Hyer is serious about wanting to remain an MP after the next election, he’s going to have to think about money. In 2008 (the last election year for which information is currently available), Hyer and the NDP spent about $70,000 on the local campaign. It’s likely that he spent as much, or more, in 2011, and who knows how much the NDP EDA spent pre-election, or how much the EDA contributed to his campaign. As an Independent, Hyer is going to be on the hook to raise all that money himself, and he’s going to have to do it all during the 35-day writ period. Of course, he might not need to spend as much to win next time around, relying instead on name recognition. Although with the likelihood being very high that the NDP will be running a candidate against him, I would think that if he’s serious, he’s going to have to spend some serious dollars, as one of the dirty little secrets of Canadian democracy is that, for the most part, successful local campaigns are those campaigns which are nearly or completely fully funded. Generally speaking, if you don’t pony up the money, you’re likely not going to get elected. In rural Northern Ontario, there’s not a lot of support for the long gun registry. I’ve generally avoided writing about the registry altogether, as I’ve found it to be more of an emotional touchstone issue than anything else. For me, it was a well-intentioned but poorly implemented public policy. My Party does not have any member-approved policy on the registry, likely because the Green Party has seen the whole debate about the registry as a distraction from getting down to work on more serious issues related to gun control. In the vote in 2011 to dismantle the registry, Green MP Elizabeth May voted with the NDP, Liberals and Bloc to save the registry, but made it very clear that it would have been her preference to make some significant changes to it, rather than be forced to simply vote for it or against it. But the Conservatives left all MP’s no choice in the matter. In absence of member-approved policies, I’ve no doubt that May based her vote to save the registry on the Green Party’s values and the wishes of her constituents in Saanich-Gulf Islands. Vision Green 2011, the Party’s comprehensive position document, speaks to the need to reform the registry, making it “free” and “fair”. Actually, the Green Party’s emphasis on firearms policy has little to do with the registry, and much more to do with preventing illegal hand guns from entering Canada (and giving our border security the tools they need to do the job, which I note now at a time when the Conservatives have decided to cut front line border guards, despite their stated “law and order” agenda). See Section 4.11.7, Gun Control and Ownership Rights, of Vision Green 2011 for the Green Party’s positions on firearms. 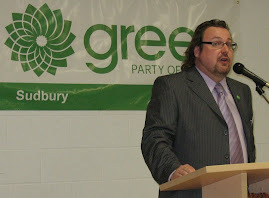 With the lack of member-approved policy on the registry, and the lack of opportunity for a political compromise to be found which would have brought fulsome changes to the registry, it’s quite likely that if the Green Party had another elected MP in Ottawa, that Green MP may have used the interests of their constituents as guidance for their vote. The Party’s Green Values of participatory democracy and respect for diversity would have also guided this hypothetical MP’s vote. Given these circumstances, it’s quite possible that another Green MP in parliament would have voted with Hyer and the Conservatives to dismantle the registry. That hypothetical MP’s punishment for voting to dismantle the registry, contrary to our Leader’s vote would have been…well, nothing at all. Such a vote could very well be considered to be in keeping with the values of the Green Party of Canada. The vote would not have been whipped, and any elected MP would have been able to vote as they determined to be best. Like Bruce Hyer, the Green Party wants to do politics differently. One of the compelling reasons which members often cite for joining the Green Party is that we’re not really much of a “party” at all. By that I mean the Green Party of Canada is probably the least partisan national political party currently operating on the North American continent. Besides being a “big tent” party which has welcomed members who once belonged to the NDP, Progressive Conservatives or, like me, the Liberal Party (along with members who have never been involved in party politics), the Green Party’s emphasis on grassroots decision-making based on shared values permeates throughout the structure of the Party. While the NDP, Liberals, Conservatives and Bloc are all leader-driven parties, the role of the Leader of the Green Party is extremely limited. Our Leader can’t create policy or overturn member-approved policy in the same way that Tom Mulcair seems to want to run roughshod over some of his Party’s policies. When Elizabeth May decided that she wanted to represent the Green Party in Saanich-Gulf Islands, an almost unheard of situation in Canadian party politics occurred: another member of the Green Party actually challenged our Leader for the nomination to represent the riding! May had to fight a nomination contest. This is illustrative of the significant independent streak which exists within the Green Party. In short, the Green Party can in no way be considered “disciplined” in the same way that the Conservatives, Liberals and NDP can. And we thrive on our ability to publicly disagree with one another on matters of policy and politics. That party members can do so without the fear of reprisal is simply staggering. Please take my word for this, as I have some considerable personal experience for publicly disagreeing with members of my Party, including our Leader, on issues of importance. I can tell you at no time has anyone, including Elizabeth May, ever asked me to keep quiet or to even tone down how I’ve expressed my opinion. I’m sure I’ve irritated some Party members along the way, but we all understand that we’re in this together, and that we belong to a Party which encourages dissent, because dissent leads to critical analysis and discussion, and ultimately to better public policy. That’s what bottom-up decision making is all about. Certainly, The Green Party’s lack of partisan focus has created some significant challenges for the Party. It might be a safer electoral strategy to mimic the Conservatives and NDP and stick to focus-group developed talking points in order to best articulate the Party’s messaging. But to do so would run counter to just about everything which the Green Party stands for in terms of participatory democracy. And the Green Party has been thinking ahead to a time when answering the question about having a party whip becomes more than an academic exercise. With only one MP in the House right now, there is no need for a party whip. But, it seems to me that based on the Party’s grassroots approach to decision-making, our shared value of participatory democracy, and a reluctance to impose top-down control in just about everything we do, I just can’t see the Party ever successfully using a whip. “The single most empowering benefit of being a Green MP is that I am not oppressed by the top down system of all the other parties. Every day the pages deliver to every desk (except mine) the instructions from that party’s whip: Vote yes, vote no. Complete instructions. No individual thinking or action is allowed by any of the other parties. It has been a far greater level of control than I had expected to see. Contrast May’s approach to party politics with that of NDP Leader Tom Mulcair, who spoke about Hyer’s resignation from caucus: “In the Canadian parliamentary system, there is a caucus system. You vote with your party and you vote with your caucus and there will come times when you have to impose that.” (see: “I’m not whipable: Ontario MP quits NDP caucus over gun registry”, the Globe and Mail, April 13 2012). I guess party politics is all very black and white for Tom Mulcair, and given his past experience with the Liberal Party in Quebec and his current experience with the federal NDP, that stands to reason. But what Mulcair seems to refuse to want to acknowledge is that it doesn’t have to be that way, and in fact, for one national political party (the Green Party of Canada), it’s not that way. As Tom Mulcair continues to build on the NDP’s record of silencing independent-thinking candidates like Hyer and whipping all of his MP’s into the voting equivalent of bleating sheep rather than allowing them to truly represent the constituents who elected them, it’s clear to me that the NDP can not help stem the erosion of Canadian democracy. In short, they are a significant part of the problem. Does anybody really think that Prime Minister Mulcair is going to exercise less control over his cabinet and caucus than Prime Minister Harper currently does? So, to recap, Hyer left the NDP caucus over concerns about Mulcair’s desire to reinstate the long gun registry, and over the NDP’s continued shift towards command and control top-down politics. That alone would be reason enough for Hyer to leave the NDP caucus, given the recent ostracism he experienced related to his vote to dismantle the long gun registry, and his concerns about Mulcair’s stated desire to whip future votes on a resurrected registry. Those connections are very clear, and Hyer has also suggested that he felt that being overlooked by Mulcair for the NDP’s shadow cabinet was also problematic, given his previously role in shadow cabinet. So, why then Hyer’s remark about climate change? Needless to say, I found Hyer’s concerns very interesting indeed. I can only speculate that Hyer is expressing his concerns over the entrenched position of the NDP to continue to sideline a sensible carbon tax policy in preference to Cap and Trade, championed by Tom Mulcair, despite the growing evidence which suggests that Cap and Trade will be a massive boondoggle and may not actually lead to reducing emissions. I think that Hyer might share my own fears that politics is getting in the way of taking meaningful action to address the climate crisis, and he couldn’t help but note this when he chose to leave caucus. With the Liberal Party having abandoned Stephane Dion’s carbon tax policy wholesale after 2008, Hyer is going to find himself sitting near the only MP in parliament who belongs to a Party which unequivocally campaigned in 2011 on the imposition of a revenue neutral carbon tax. Of course, that’s Green Party Leader Elizabeth May, who along with Hyer, understands that there’s a bit of urgency around the need to take action on climate change. Look, we can’t continue to let politics get in the way of doing something to begin the process of decarbonising our economy. For far too long we’ve put off doing what we know we should be doing to reduce our fossil fuel consumption. As a result, we’ve been digging a massive hole for children to climb out of in the future. With the anticipated effects of climate change expected to cost the Canadian economy over $6 billion dollars in 2020 (and rising every year thereafter), our lack of foresight and planning and, let’s be honest, our complete disregard to this pressing issue has left Canada economically disadvantaged. Other countries are embracing the green economy of the twenty-first century; Canada under the Liberals and Conservatives seems content to continue being wed to the brown economy of the 19th century. I know Hyer understands this. In fact, I think the NDP understands it too. But the NDP has been far more focused on saying the right things to get elected, rather than developing sensible public policy. It must be very frustrating to be a supporter of the NDP, given that party’s record for abandoning its principles in pursuit of electoral success. And the NDP will certainly be doing more of that in the future, under Tom Mulcair, as Mulcair takes his party further down the road of populist boutique policy development. I’ve got a lot of respect for Bruce Hyer to stand up for the things which he believes in. As an elected MP, I’m sure his decision to leave his caucus was not an easy one to make, given his long history with the New Democratic Party. However, I think that Hyer sees that the NDP of today isn’t quite the same as the NDP he joined years ago, or that it at least hasn’t lived up to expectations, despite its recent electoral success. Politics does not always have to be about the pursuit of power. Politicians often lose sight of the fact that they are elected as public servants; they are put into power to do public good, and not simply to figure out a way to gain or hold onto power. The pursuit of power alone can not and should not justify decision-making. The NDP used to understand this, but over the past decade, there has been a drift. Over the next decade, under the leadership of Tom Mulcair, I expect that drift to continue, especially if it brings the sort of electoral success which I suspect it might. Where, then, does that leave principled politicians like Hyer, who want to continue to represent their constituents without slavishly following partisan political doctrine? The Conservatives, Liberals and New Democrats would suggest that it should leave MP’s like Hyer on the sidelines, or better yet, not see them elected in the first place. However, I suspect that like Hyer, most Canadians are fed up with ultra-partisanship of the three big national parties, and in the process, condemn all party politicking. Yet, until real reform is brought to our electoral system, political parties will continue to thrive, because only political parties can raise the kind of money needed to win elections. That’s our current electoral reality, and I despise it, as I think it’s an absolute affront to democracy. But given the reality in which we find ourselves, it’s necessary to dwell within the system for now, with the goal of bringing about real and meaningful change from the inside. It would be a shame to lose a strong and sensible voice like Bruce Hyer’s from our parliament, and not just for the good people of Thunder Bay-Superior North. All Canadians should take pride in elected public servants like Hyer. I only hope that Hyer might come to a different conclusion about party politics in the near future, and discover that his own values appear to be extremely well-suited to the values which many of my friends hold dear. Something to think about, Mr. Hyer. What a thoughtful piece of writing.